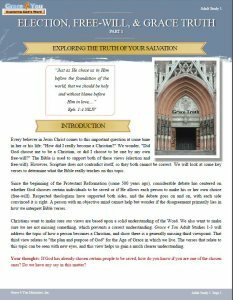 Study 1: Election, Free-Will, & Grace Truth (Part 1) | Grace 4 You Ministries, Inc.
Every believer in Jesus Christ comes to this important question at some time in her or his life: “How did I really become a Christian?” We wonder, “Did God choose me to be a Christian, or did I choose to be one by my own free-will?” The Bible is used to support both of these views (election and free-will). However, Scripture does not contradict itself, so they both cannot be correct. We will look at some key verses to determine what the Bible really teaches on this topic.